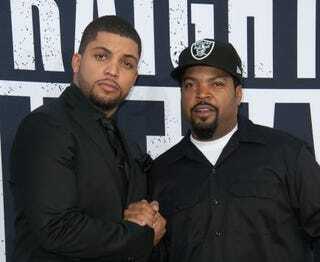 O’Shea Jackson Jr. and his dad, Ice Cube, arrive for the premiere of Straight Outta Compton Aug. 10, 2015, in Los Angeles. What do you do when you're being blamed for something and you're already amid controversy because of #OscarsSoWhite? You pass the blame onto someone else, of course. After Thursday's uproar over the cast of Straight Outta Compton not being invited to the Oscars by the Academy of Motion Picture Arts and Sciences, the organization issued a statement saying it wasn't its fault. "The academy invites the nominees only, and each studio gets a limited ticket allotment, based on the number of nominated films, to use at their discretion. It has been this way for decades," an academy spokesperson told People magazine. Universal Pictures is the studio behind the hit movie, but it has yet to comment about the invite confusion. Maybe the studio ran out of invites? Universal has four academy nominations, including one for Straight Outta Compton's four writers, who are white, for the movie's screenplay. I'm still amazed the movie didn't employ not one black writer. But that's a whole different story. #WritersRoomsSoWhite?